One of the things about me as a homebrewer: When I get an idea in my head, it won’t leave until I eventually brew it. Sometimes that’s a good thing like when I wanted to age a big stout on oak, cacao nibs, bourbon, and vanilla beans for my ISO: Whalez, Bro! Imperial Stout. Sometimes it doesn’t work out as well (I’m looking at you, maple bacon breakfast stout I did three years ago). The point is that’s the fun part about this hobby; I can brew something a bit outside the box and its no biggie if it doesn’t turn out. If you haven’t gotten the gist of this yet, this batch is an experiment for me. I’m trying three things I’ve never done before with this brew. I’m using Brett, doing a Saison, and using fruit. I’m not overly big on Saisons, but I’m slowly coming around on them. When on the more citrusy, fruity, and tart side, I like them. When they get more peppery and “Belgiany” I tend to not like them as much. The Saisons I’m most trying to emulate are from Hill Farmstead. Obviously that’s a VERY tall task and I don’t expect my first try at the style to even be in the same ballpark as them, but I still look to them for inspiration. Some of their Saisons are blended with Brett, and have a tart funkiness that’s just great. They have their own strain cultivated I’m sure, and I don’t have anything close to regular access to their stuff being in Illinois, so I had to find a good yeast. I didn’t want to buy a bunch of different yeast packs to blend since this was a small batch and I didn’t want to waste money. I found Wyeast 3031 Saison Brett from their Private Collection series. This sounds like it should fit what I’m trying to do pretty well. The beer should have some Saison earthiness, while the Brett should lend some tropical tart funkiness. I used a Pilsner malt base with some oats and wheat to give it some body since the yeast should get this beer pretty dry. The other part to this beer is the apples. 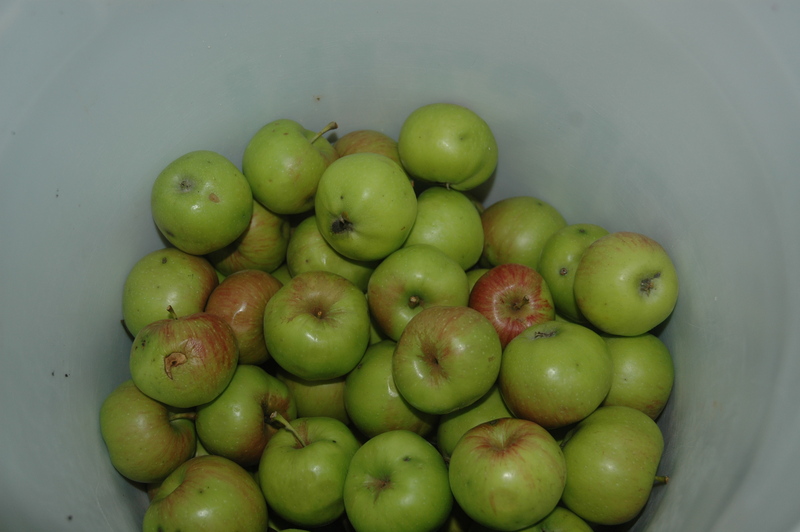 I had an apple tree in my back yard that I unfortunately had to cut down, but I was able to harvest a pretty good number of Bramley apples, probably 100 pounds worth or so. Bramley apples are a bit tart, and I’m hoping that they may compliment the tartness of the Brett. In all honesty, I just really wanted an excuse to use these apples in a beer and I really didn’t feel like doing some kind of apple spiced beer. I’m not sure how much the apples will contribute, but I figured why not try? I cut up two pounds of these apples and froze them for a couple of days. I then added them at a week and a half after primary fermentation was complete. Its fun to go into a beer with no real expectation of how it may turn out. With a lot of the beers I do, like my IPA’s, I’ve got something very specific in mind that I’m trying to achieve. With this beer, I’m just excited to see how it goes! A bit duller looking than my usual brew day! 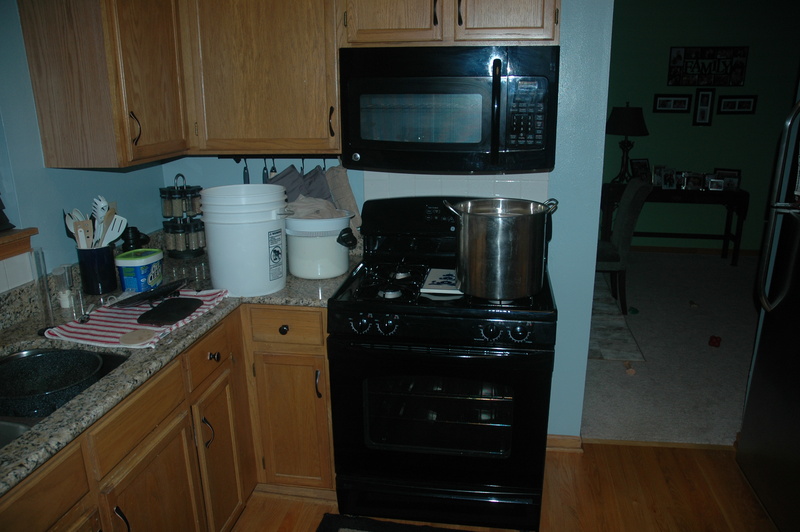 The brew day was a kitchen stove top weeknight batch. Everything was pretty quiet compared to the usual brew day, just me and the dog. The only error was overestimating how much my stove would boil off over 90 minutes. I wound up with a bit over my batch size and came in a bit under gravity at 1.054, but that may be better in the end anyway. Other than that, just another brew day in the books! Bottling Update: I bottled this batch a few days ago. The FG came in at 1.002 so this beer dried out nicely! The ABV should be 6.8%. The hydrometer sample tasted really good already. There was definitely a bit of tart apple flavor, and the Brett character was just beginning to develop. I’ll probably crack one of these open in a few weeks, post some notes, and then sample it again after the Brett has some time to work in the bottle. Appearance: Farmhouse Disco pours a moderately hazy straw gold color. The beer poured from the bottle with a good two fingers of fluffy white head that clings to the side of the glass. Lots of small bubbles from the higher carbonation. Smell: Pretty heavy on the fruity/funky Brett aroma with some undertones of classic Saison barnyard. There’s some lemon like citrus, apple, some hay like graininess. Pretty light on the Belgiany Phenolic aroma. Taste: Pretty heavy on the Brett funk! I don’t have a ton of experience with Brett beer, but this is in line with the one’s I’ve had. Some lemon, a slight hint of grapefruit, some spiciness, and a bit of pepper. The apple tartness blends well with the Brett. 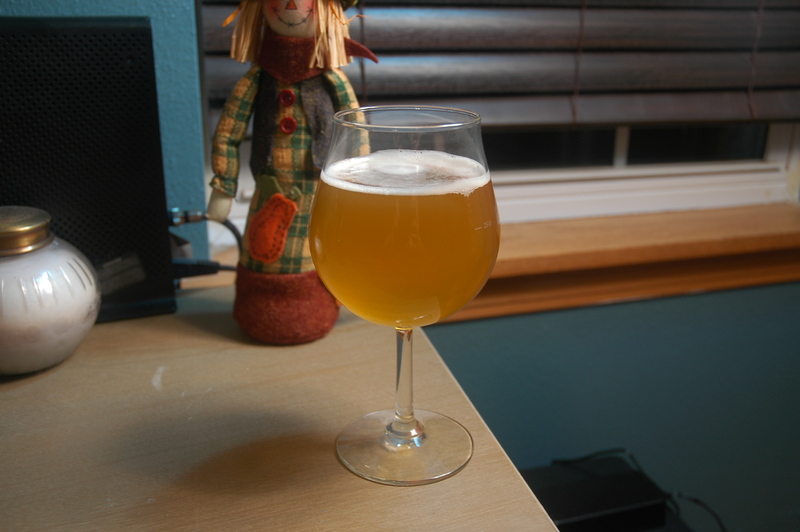 The Brett outshines the typical Saison flavors, I wish I would have fermented this in a warmer spot. Outside the Brett funk its a bit bland. This one is pretty dry, so not much malt flavor is evident under the funk. Mouthfeel: A bit of bite from the higher carbonation level. Dry, but not too thin thanks to the flaked oats and White Wheat. I’d consider bumping up the mash temperature and chloride level to try and soften the mouthfeel on this one further. Overall: Not bad at all considering the number of new variables at play! I’d consider brewing another Brett Saison, but it wont be this recipe again. That’s not to say I don’t like it, but the point of this one was to make use of my homegrown apples in a different and fun way. When I brew another Saison, there’s an American Farmhouse Strain from Omega that I’d like to try that blends Brett and a Saison strain from a Northeastern brewery. I’d also use fruitier hops to compliment the Brett fruity and funky notes. All in all this was a fun brew to try, and definitely something outside my wheelhouse. I’m trying to gain a better appreciation for these types of beers, and brewing this one helped go a long way towards that goal.